Unfortunately time constraints (i.e my day job) keep getting in the way of me updating this site so all Ive been able to do so far for the Bolton Wanderers Nickname page is a very basic bit of background. 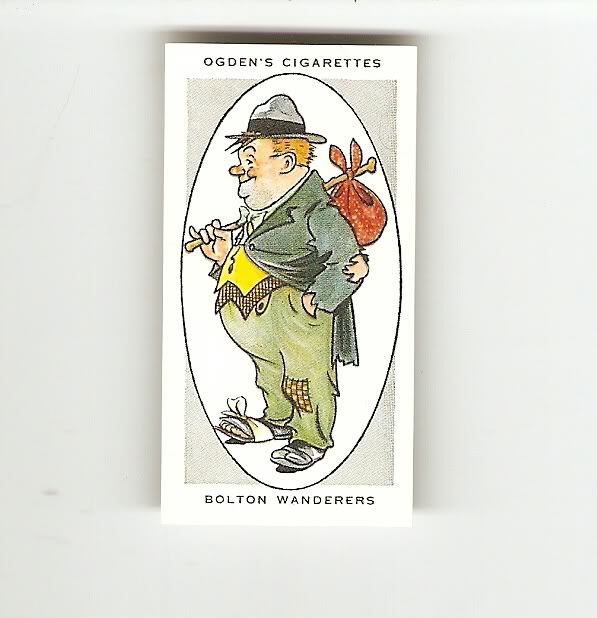 Ive shown below a football cigarette card from the Ogdens AFC Nicknames series that shows a caricature that depicts a "Tramp", and to be honest Im not sure what the significance or relation to the football clubs nickname is supposed to be ? "The club was founded in 1877 and has the wonderful record of having won the Cup three times from 1923 to 1929. Boiled sheeps feet, familiarly known as trotters, are supposed to be a favourite dish with the people of Bolton, and the story runs that on the occasion of one famous match a big supply was provided for the visitors. Piles of sheeps feet were displayed in the shop window and they created such an impression that Wanderers were at once dubbed the “Trotters”. The nickname still survives although it is not as commonly used as some years ago." So, sorry, thats all Ive done so far but Im sure theres a lot more to expand upon with this football clubs nickname so dont worry I will be coming back to this page to do a bit more ! !